Information on gravestones may provide some insights into the local community and its history. Names were recorded on the database as either a ‘Primary’ name, a ‘Secondary’ name or ‘Other Deceased’. The primary name was the first named deceased and the secondary name was their spouse. In one case where parents had erected a headstone for their children, the secondary name is a sister. 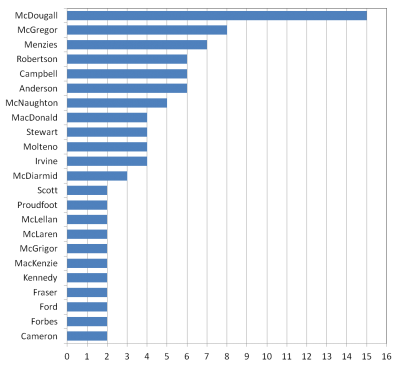 The chart below shows the frequency of family names recorded as primary names on the graves in Fortingall churchyardb over the entire database. In this case only those names that occur more than once are shown out of the 77 family names recorded. For simplicity, MacDougall (2) has been added into McDougall, MacGregor (1) to McGregor, MacNaughton (1) to McNaughton, McDonald (2) to MacDonald and MacDiarmid (1) to McDiarmid. The family name McDougall dominates the list and is recorded on graves from 1774 to 1992. 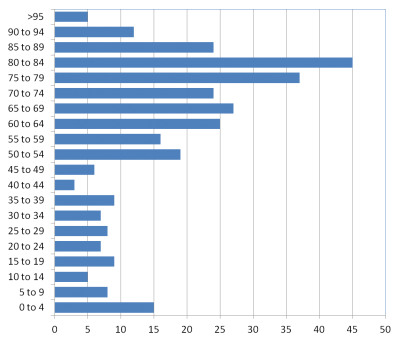 The frequency distribution of family names in the 1881 census for Fortingall parish is dominated by the following families: Cameron (151), Stewart (113), Campbell (104), Robertson (75), Menzies (71), McPherson (70) and McDonald (68). If the primary family names from just the period 1870 to 1930 are selected from the graveyard database, the most frequent are in the following order: McDougall, McGregor, Robertson, Campbell, Irvine, MacDonald and McDiarmid. The difference between the gravestone information and the census is interesting. 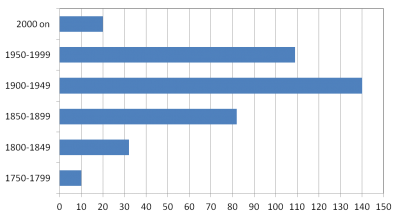 The age at death as recorded on the gravestones, grouped into five year periods is presented in the chart below. The age group 80 to 84 dominates. For many reasons the gravestone data do not represent the population demographics at any particulat time. 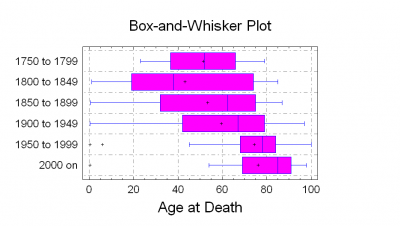 Statistical analysis by Analysis of Variance of the age at death for different time periods is shown below as a Box and Whisker plot. In this chart the data are divided into four equal areas of frequency (quartiles). A box encloses the middle 50 percent, where the median is drawn as a vertical line inside the box and the mean shown as a cross. The left (or lower) whisker is drawn from the lower quartile to the smallest point within 1.5 interquartile ranges from the lower quartile. The other whisker is drawn from the upper quartile. Crosses outside the box for the 1950 to 1999 and 2000 on periods are outliers in these data sets. The effect of time period is statistically significant, with Age at Death rising over time. However given the possible factors influencing which deaths from the population were recorded by graves and how these factors may have changed over time, the interpretation of this trend in the data is not straightforward.